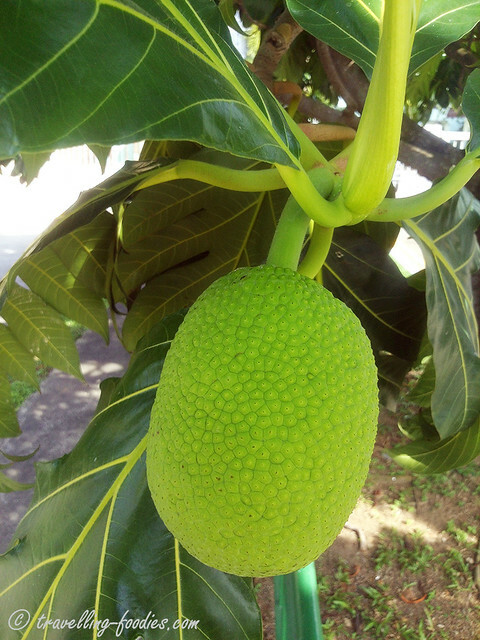 Breadfruit is one of those things which I have been curious about for the longest time. It grows in the tropics but yet remains highly elusive in Singapore. For one, no one sells it in the markets, so it really takes quite a bit of looking around to find a tree. Yes there are a few trees around on our island but they remain in the “rare” category. I have encountered two trees so far, one near my place and other near a friend’s place in the east. Despite its wide distribution range from the Polynesian and Oceania Islands all the way to Kerala on the southern end of continental India, breadfruit doesn’t seem to have been widely incorporated into local cuisines very much. It remains much in the “exotic” category, far from being a staple for most. So it got me very curious as to what it tastes like, how it should be prepared and what it could be used to cook. 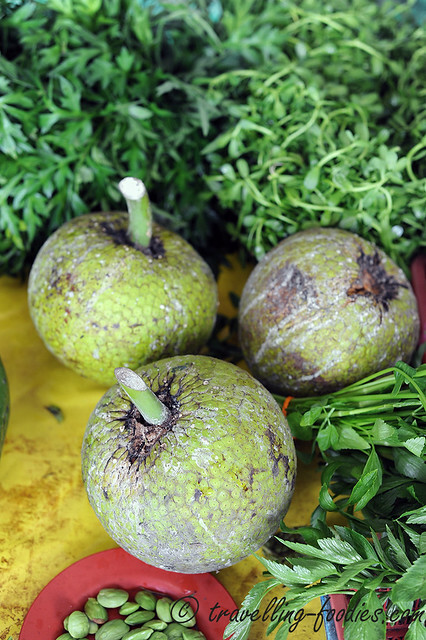 Breadfruit is known locally as “buah sukun” or simply “sukun“. It belongs to the same family as jackfruit (buah nangka) and cempedak, as well as another elusive fruit known as buah keluweh (otherwise known as kluwih or keloi). Despite being taxonomically described as two distinct species, buah sukun （Artocarpus altilis) is speculated by some to be a selectively cultivated form of buah keluweh (Artocarpus camansi). The former is preferred as it is “seedless” compared to buah keluweh which has seed structure similar to that of cempedak. I’d taken the above photo of a fruit bearing tree near my friend’s place in the east. Alas, the fruit was still too young to be harvested. When ripe, they grow to the size of a volleyball thereabouts. There were so many things I want to do with the fruit. Breadfruit are commonly enjoyed as crisp chips being thinly sliced and then deep fried. Some folks would robe them with a batter and deep fry them as well. Otherwise they can also be first parboiled and then cooked into a thick coconut-gula melaka based sauce to become a pengat. For a twist of savory, it can also be cooked into “sukun masak lemak“. Unfortunately, the breadfruit I bought have become too soft for any of these dishes when I’d finally decided to work on it, no thanks to my procrastination. The interior was creamy and yellow, which kinda reminds me of avocado actually, but much more fibrous, like what one would expect upon prying upon a jackfruit or cempedak but void of any seeds. Even the aroma resembles avocado quite a bit. I have heard of folks using it in a kueh bingka, as a substitute for the usual cassava/tapioca. 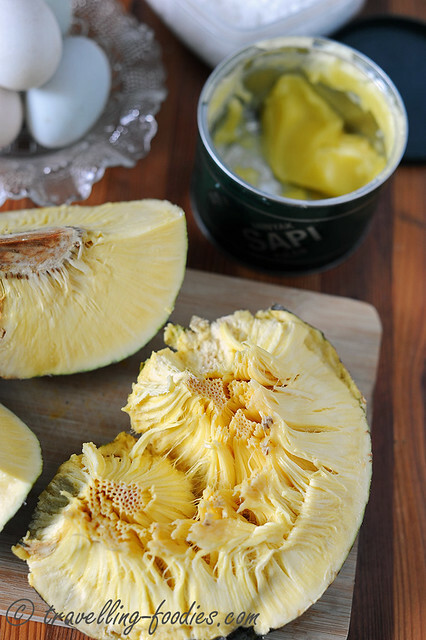 This is a good way to make us of breadfruit which have become too soft or overripe. So it seems like Kueh Bingka Buah Sukun it is destined to become. Using a food blender, pulse the buah sukun pulp until the fibres are broken down slightly. I chose not to pulverise it completely to retain some texture. Add all the other ingredients into a mixing bowl with the buah sukun pulp and mix well until homogeneous. I did this with my Thermomix. Pour the mixture into a 7″ square baking tin which has been greased and lined with baking paper. Bake in a preheated oven for 170C for 45 min. Turn the cake to ensure even browning and continue to bake for another 10-20 min until the top develops a lovely golden brown hue. Set aside to cool to room temperature before cutting. How do I like it? Well, the taste and texture is alien yet strangely familiar at the same time. I can’t put my finger down on where I’d had something like that before. The texture is softer than Kueh Bingka Ubi Kayu. For that, I prefer the latter actually as I like the kueh with a bit more bite. 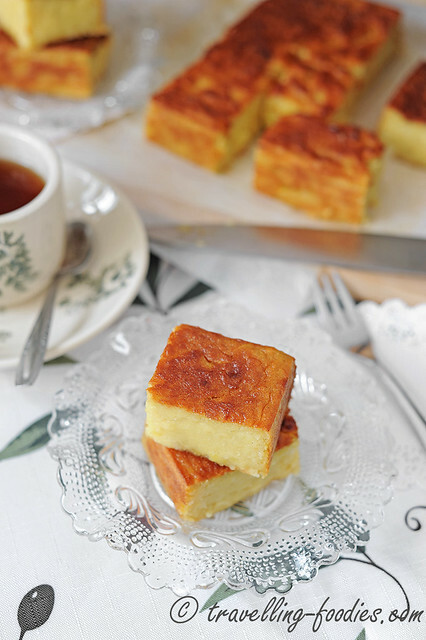 It has a somewhat custardy palate sensation which likens Kueh Bakar incidentally. The aroma is also notably different compared to the baked cassava cake which we are used to eating. But it is interesting nonetheless and now I can proudly say that I’d finally dealt with breadfruit before. This entry was posted on July 5, 2014 by Alan (travellingfoodies). 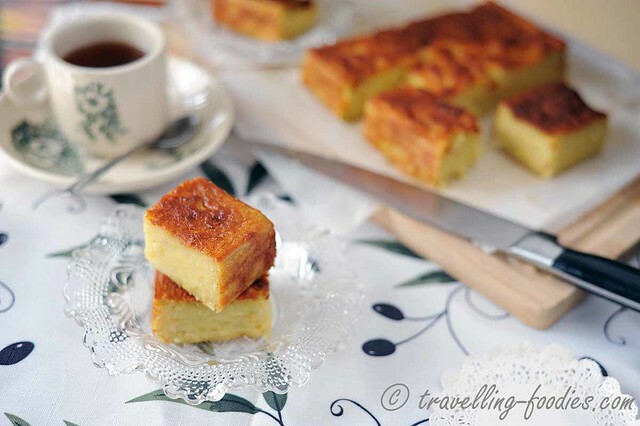 It was filed under Food, Simple Eats, Travel and was tagged with Baba, bengkah, bingka, Bingka Ubi Kayu, bingkah, bread fruit, buah sukun, malay, Nonya, Nyonya, Peranakan, straits chinese. Wah this kuih looks good. I never have it this way except frying it in batter. However, I have never heard or made cakes with it. I need to try your recipe.